Yesterday, I picked up some wheatberries and, on sale, some nice looking broccolini. I thought that I'd try cooking them together and, for all the wonderful nutrition of beans, including beans. Wheatberries cook in a 1 part berries to 3 parts water over 25-30 minutes. I wanted to use navy beans which are small and cook quickly (25-30m unsoaked and 5m less if soaked, cooked with just enough water to cover), but didn't have them. Instead, I used Great Northern beans, which are cooked similarly but use a little more water (water to just cover plus 1/2") and cook over 30m unsoaked for 25m soaked. By the way, I've followed traditional advice, such as by the US Dry Bean council, to not add salt till the end of cooking, to avoid toughening of skins. (I didn't realize that acids are also recommended to be added afterwards; I've used tomato and tomato sauce, and have had good results.) However, I've seen some suggest that soaking in salt water and then adding just a pinch of salt when cooking leads to more consistently textured beans and stronger flavor. I might try this in the future. Here is what I did. I put the beans, wheatberries, water, garlic, fennel seed, turmeric, and bouillon cube into my Instant Pot pressure cooker and cooked for 30m. After the cooking was done, I waited a few minutes and gently released pressure. 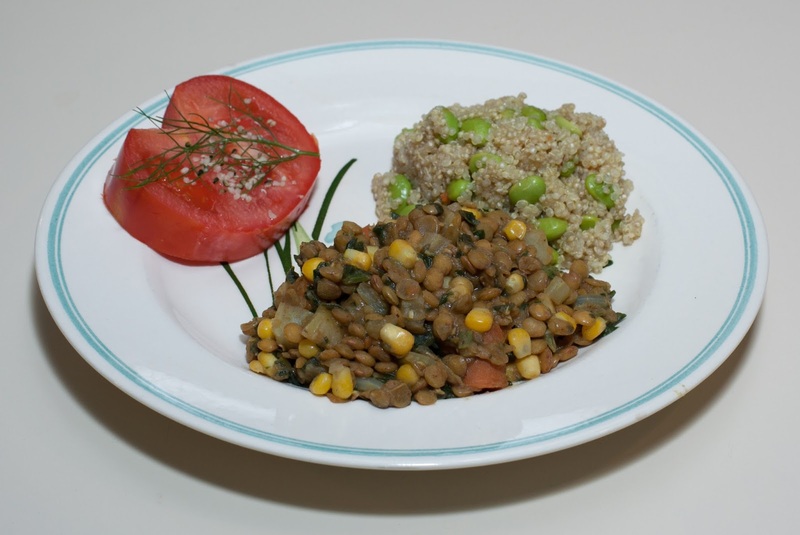 I opened the pot and tried the beans and wheatberries - they were already good! The beans were cooked just fine, but I wouldn't mind it if they were just a tad softer. I added the broccolini, onion, lemon juice, and salt, then served. We surprisingly were low on salad ingredients, but we had some bean sprouts. I served them, as well as some carrot. I was impressed with this combination! We all enjoyed the meal. 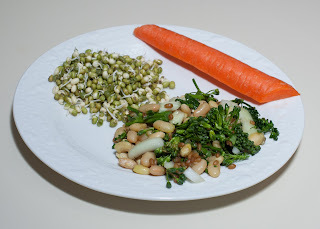 The broccolini was good still fresh and just slightly wilted by being mixed in with the hot beans and wheatberries. 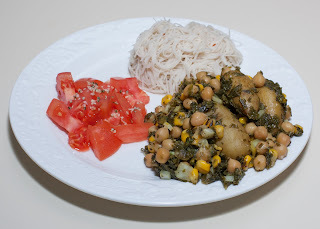 The fennel seed added a nice flavor. I need to continue to explore wheatberries cooked with beans and other vegetables - this is a winning combination for taste, texture, and, of course, nutrition. Some lime zest might be nice. I might cook for 32-35 minutes next time, and maybe garnish with some fresh fennel. I need to add fennel seeds to a regular rotation in my cooking. We were delayed in getting home and my wife wanted to eat soon, suggesting that I prepare something fast and simple, perhaps a frozen food. I had some Candle Café frozen Chili Tempeh Vegetable Empanada on hand, as it was on sale recently. 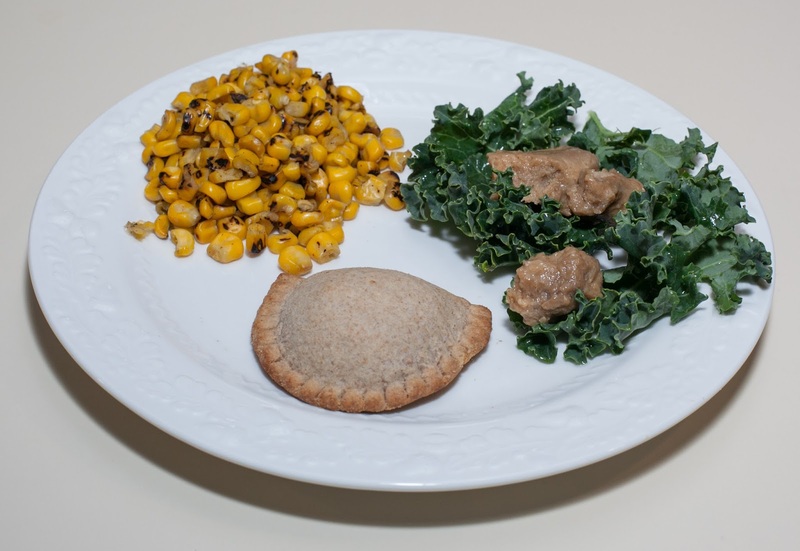 Dinner was simply the empanada, along with some roasted corn kernels, and chunks of seitan over kale. I like these empanadas, but they are rather rich at 13g of fat per serving of two empanadas. I haven't cooked with chickpeas in a while so this afternoon decided to soak a cup of dry chickpeas. Normally, they take 20-25m to pressure cook (with water enough to just cover) if they have been soaked overnight and 35-40m unsoaked. I had five hours of soak time, so tried a cook time of 30m. 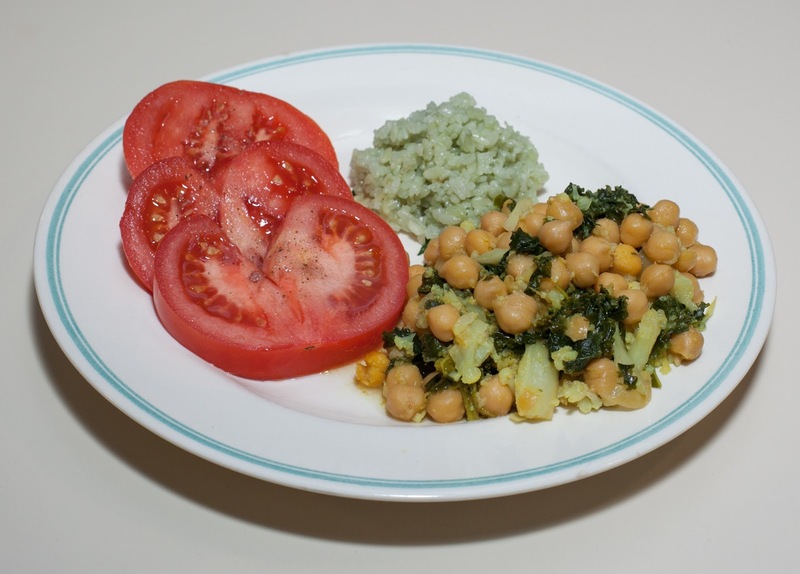 I often add frozen or fresh vegetables like kale after pressure cooking, but decided to try cooking some kale for the entire half hour to see how it would integrate with the dish. I rinsed the chickpeas and then put them in my Instant Pot pressure cooker, along with the water, potatoes, garlic, kale, and bouillon cube, and cooked for 30m. After the cooking was done, I waited a few minutes and gently released pressure, then added the corn and onion. Since the corn was frozen, I covered the pot (but didn't turn it back on) and let it sit for a few minutes, which nicely warmed things up, before serving. 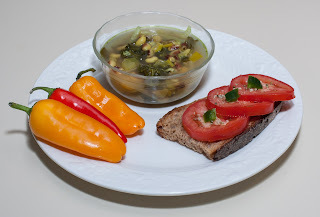 I sampled and liked the dish, but realized that miso would go with it, so added the miso (it would have been great mixed in and cooked), as well as the cumin and turmeric. Dinner was good. The potatoes and chickpeas were cooked just right, and the kale was fine, though I didn't see a significant taste difference from just adding it at the end of the cook time. Ginger would go well with this, and miso would be good added before cooking. I'm pleased that fingerling potatoes can be cooked so easily with beans, and will have to make more dishes with intact small potatoes prepared in this way. We are having some really cold weather even below freezing. Yesterday, we had stopped at a favorite restaurant, Vimala's Curryblossom Cafe, for a snack, and enjoyed a black-eyed pea soup. I thought that I would put together a version of such a soup for tonight. 1 cup onion cut into half moon slices approx. 1/4" x 1 1/4"
I put all of the ingredients except the salt and onion into my Instant Pot pressure cooker and pressed the "Soup" button for half hour of pressure cooking. After the cooking was done, I waited a few minutes and gently released pressure, then added the salt and onion and served. I had a yummy 8 ounces of tempeh that I wanted to cook, but I know that my daughter doesn't like tempeh, though she sometimes enjoys smoke-flavored tempeh. She and I love tofu, but my wife can't digest tofu. I decided to make a dish with tempeh cooked in and to serve around the tempeh for my daughter, substituting raw tofu. Here is what I did. I put all of the ingredients except the onion into my Instant Pot pressure cooker and cooked for only two minutes. After the cooking was done, I waited a few minutes and gently released pressure, then opened the pot and mixed in the onion, and served. 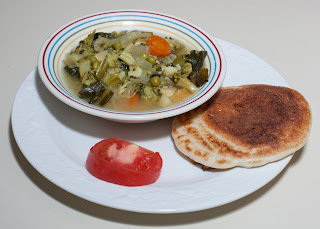 I was wondering what a simple lentil or split pea stew with artichokes might be like. This may come from a recent idea that I had, and still am looking forward to trying, of cooking big pieces of lemon into a dhal and making a Mediterranean-flavored lentil soup with plenty of lemon. I thought that I'd let the artichokes cook instead of having them added at the end, to soften the artichoke and possibly partially dissolve the artichoke, marrying the flavor with the split pea base. Split peas cook in a 1:3 ratio to water over 6-10 minutes, and I cooked for the full 10m to soften the artichoke as much as possible. Here is what I did. I put the split pea, water, artichoke hearts, leek, kale, bouillon cube, and cumin into my Instant Pot pressure cooker and cooked for 10m. After the cooking was done, I waited a few minutes and gently released pressure, then mixed in the lemon juice, salt, and garlic powder. I also made long-grained brown rice (1:2 ratio of rice to water, a bouillon cube, and the brown rice 50m program in my Zojirushi rice cooker). Dinner was very good! We all really liked the split pea and artichoke combination. I added just a bit more salt after serving to bring out the flavor of the main course better. A little caper or chopped olive added at the end, as well as raw onion, would be welcome. I should have put ginger and garlic in when I started cooking. I should continue experimenting with cooking with artichoke. I wonder if a longer pressure cooking time would further soften and mingle the artichoke with other ingredients. 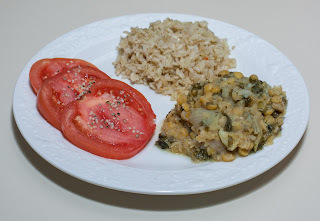 This is the last night of my Dad's few week visit, and I thought that I would prepare a green lentil dish. Green lentils cook in a 1 part to 1.5-2 parts liquid over 15-20 minutes under pressure. I love citrus and thought that I'd include some fresh squeezed navel orange juice in the liquid. Here is what I did. I rinsed the lentils then put them in my Instant Pot pressure cooker, along with the water (I actually substituted the juice of two navel oranges, about 1/4 cup, for part of the water), fennel, carrot, turmer, cumin, and bouillon cube, and cooked for 18m. After the cooking was done, I waited a few minutes and gently released pressure, then tried the lentils. The citrus was not noticeable, so I added the lemon juice and remaining ingredients. Because I used frozen corn and spinach, I turned the Instant Pot on for another minute under low pressure. When I was ready to serve, I opened the pot slowly, and served. I also made some quinoa with edamame. Lately, my wife and daughter have been enjoying dinner more than I have, and today seemed to be the case, again. Dinner was good, but the two of them enjoyed the lentils more than I did. My Dad seemed to also enjoy the meal. I was quite pleased with the texture of the lentils; I wanted a thick stew that I could serve on a plate, rather than a dhal, and that's exactly what I got. The Instant Pot pan had just a bit of sticking, which means I put just under the right amount of liquid in. The lentils were not very soft, but were certainly cooked and ready to eat, even for somebody like my Dad who likes soft food. 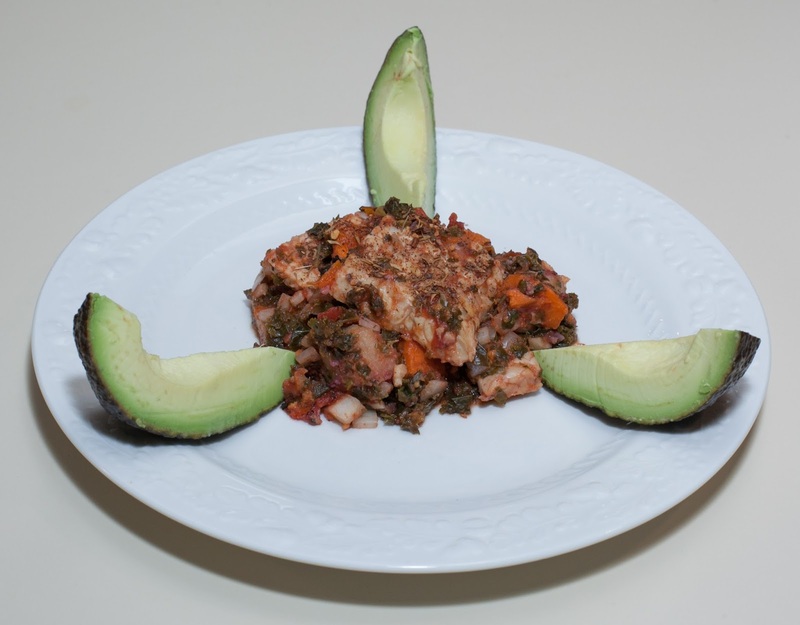 I loved the simple combination of the edamame and quinoa! It was the star of the meal, but just for me. I forgot to add ginger to the lentils. Next time, the lentils may benefit from maybe a 20m cook time. I should try cooking lentils entirely in citrus juice. Let me remember the quinoa and edamame and make it again soon! Chickpeas cook under pressure in 35-40m if unsoaked or 20-25m if soaked. I rinsed then soaked in ample water for about 7 hours the chickpeas, then did a final rinse. I covered the chickpeas in enough water to just cover them, added the bouillon cube, and cooked in my Instant Pot pressure cooker for 20m. After the cooking was done, I waited a few minutes and gently released pressure, and opened the pot. The chickpeas were, predictably, done, but just a bit firm (they could have been served as they were). I added the cauliflower and kale, and cooked for another 2 minutes. When I was ready to serve, I opened the pot slowly, and added salt, turmeric, cumin, and garlic powder. I also made Jade Pearl rice.